The Odysseus is one of the biggest unpiloted aircraft ever built. 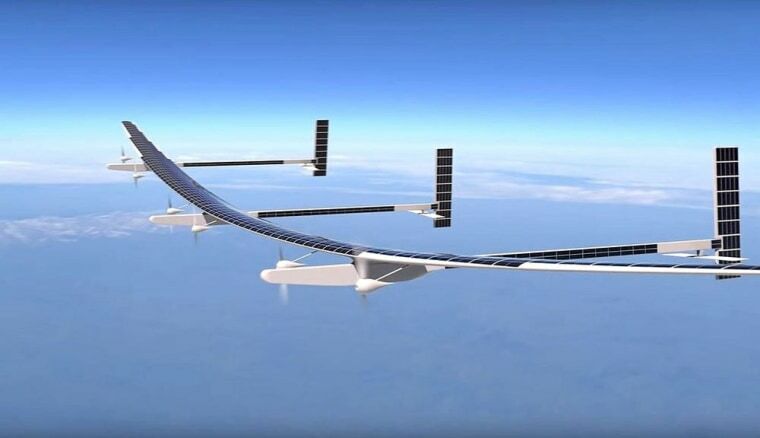 More than an ordinary aerial drone but not quite a satellite, a huge solar-powered airplane with three tails and wings wider than a jumbo jet’s will soon be taking to the skies. Odysseus, developed by Boeing subsidiary Aurora Flight Sciences of Manassas, Virginia, is one of the largest unpiloted aircraft ever built — and one of the lightest. It has a 243-foot wingspan but weighs less than a small car, the company says. Its six electrically powered propellers will be driven by energy from hundreds of solar panels that cover the aircraft's exterior or from banks of rechargeable batteries on board, depending on the available sunlight. With a top speed of 100 miles an hour, Odysseus won't be very fast. But it's designed to soar to altitudes above 60,000 feet and stay aloft for months at a time. The aircraft is the centerpiece of Boeing’s plan to join the growing market for high-altitude pseudo-satellite (HAPS) service, a less costly alternative to satellite missions for organizations that need a high-altitude platform for tasks including environmental monitoring, atmospheric research and military surveillance. Aurora’s chief executive, John Langford, said three prototype Odysseus aircraft were being built for test flights that would start in Aguadilla, Puerto Rico next spring. The company hopes to start renting out space on Aurora aircraft in several years, once the aircraft are fully developed and tested. The first two prototypes will be used to test the drone’s airworthiness and its solar power — especially during short winter days when sunlight is limited. The third prototype, due to launch in 2020, will carry experimental gear designed by Harvard scientists to conduct research on the ozone layer, and will help test Aurora’s payload capacity. Langford said the craft’s unusual design would allow it to carry payloads of up to 100 pounds. That’s significantly more than the typical customer payload of 15 pounds carried by another HAPS contender, the Airbus Zephyr drone that set new altitude and endurance records for unpiloted flight earlier this year. Some high-altitude drone designs offer only a few pounds of payload capacity. Siddharth Shihora, an analyst at the Cambridge, Massachusetts-based space industry consulting firm Northern Sky Research, told NBC News MACH in an email that high-flying drones like Odysseus could be especially useful for military applications. For commercial clients, he said, competing balloon-based HAPS platforms might be stronger contenders. Balloon-based HAPS platforms include Project Loon, developed by Alphabet (formerly Google), and the Stratobus airships developed by the French aerospace company Thales. Though balloon-based platforms may not be as easy to control or as versatile as high-altitude drones, they have the potential to carry larger payloads — more than 500 pounds in the case of the Thales design. Want more stories about futuristic aircraft?